Posted on June 21, 2016 by Philip O'Hanlon. SoundStage! Hi-Fi has declared Vivid’s limited edition B1 Decade a Recommended Reference Component. Schneider wrote an excellent review of Vivid Audio’s limited edition B1 Decade back in March. He admits to having overlooked Vivid Audio’s line of speakers for a number of years, before he stopped to give the original Vivid B1 loudspeakers a listen in 2010. They ended up being his favorite speaker for under $20,000. Read Doug Schneider’s full SoundStage! Hi-Fi review of the Vivid B1 Decade here. Or learn more about what makes the Vivid B1 Decade a Recommended Reference Component. 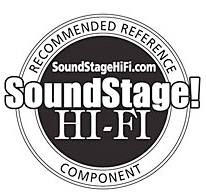 This entry was posted in Awards and tagged B1 Decade, Doug Schneider, Recommended Reference Component, SoundStage! Hi-Fi, Vivid Audio.